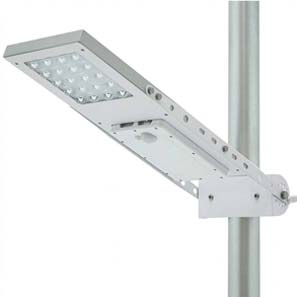 Powerbee offer a full range of Solar Street Lights to suit Your every need, from motion activated PIR lights to all night lights designed to operate in the UK. Our generous Solar Panels charge the batteries during the day, then use this energy from dusk to dawn, to operate the light. Using a high quality solar panel combined with SMD Led's. Our Lights are surprisingly bright, easy to install & there are no operating costs. Perfect for spreading light across a large area. Simply Fix the light to a wall or post, ensuring the solar panel is located in good bright location - preferably south, & switch the light on. No electrician is needed, so easy to install you can have effective powered floodlights in minutes. In winter months solar powered lights can be challenged. Our range includes, multi level brightness settings & timer functions. So whether your are lighting up your home or business sign post, the lighting time can be optimised. PIR Solar Area Lights activate the light only when movement is detected. They give you peace of mind, keeping your home or business safe and secure. Solar powered lighting requires no mains energy. The solar panel generates the power that the light needs to operate. Eco friendly, Ideal as path lights & for security. Cut your energy costs and save money today. We have over 10 years experience in this field, our Flood & Spot Lights have been tried & tested in the UK and we stock great quality products that work with our weather!